“My endorsement” by Michael Moore. Michael Moore analizes very well the politic situation on his country. He bets on Bernie Sanders and not from now, but since 1990. This article is very interesting because he speaks about SOCIALISM, but hold on, before you go and run to your dictionary or encyclopedia (ups, now we have internet!) I warn you that SOCIALISM not is a hard rule. In fact, USA do not think rigid about politic, and Mr. Moore remember it us very well. A sharp article, and I think: 2016 may be the REAL CHANGE in USA, if we look the past and think about the future. I colored the text that I believe is important, you may read the original article at this link. When I was a child, they said there was no way this majority-Protestant country of ours would ever elect a Catholic as president. And then John Fitzgerald Kennedy was elected president. The next decade, they said America would not elect a president from the Deep South. The last person to do that on his own (not as a v-p) was Zachary Taylor in 1849. And then we elected President Jimmy Carter. In 1980, they said voters would never elect a president who had been divorced and remarried. Way too religious of a country for that, they said. Welcome, President Ronald Reagan, 1981-89. They said you could not get elected president if you had not served in the military. No one could remember when someone who hadn’t served had been elected Commander-in-Chief. Or who had confessed to trying (but not inhaling!) Illegal drugs. President Bill Clinton, 1993-2001. And then finally “they” saId that there’s NO WAY the Democrats were going to win if they nominated a BLACK man for president — a black man whose middle name was Hussein! America was still too racist for that. “Don’t do it!”, people quietly warned each other. Do you ever wonder why the pundits, the political class, are always so sure that Americans “just aren’t ready” for something — and then they’re always just so wrong? They says these things because they want to protect the status quo. They don’t want the boat rocked. They try to scare the average person into voting against their better judgment. And now, this year “they” are claiming that there’s no way a “democratic socialist” can get elected President of the United States. That is the main talking point coming now from the Hillary Clinton campaign office. But all the polls show Bernie Sanders actually BEATING Donald Trump by twice as many votes than if Hillary Clinton was the candidate. Although the polls nationally show Hillary beating Bernie among DEMOCRATS, when the pollster includes all INDEPENDENTS, then Sanders beats Trump two to one over what Clinton would do. The way the Clinton campaign has been red-baiting Sanders is unfortunate — and tone deaf. According to NBC, 43% of Iowa Dems identify themselves more closely with socialism (sharing, helping) than with capitalism (greed, inequality). Most polls now show young adults (18-35) across America prefer socialism (fairness) to capitalism (selfishness). So, what is democratic socialism? It’s having a true democracy where everyone has a seat at the table, where everyone has a voice, not just the rich. If Hillary’s biggest selling point as to why you should vote for her is, “Bernie’s a socialist!” or “A socialist can’t win!”, then she’s lost. The New York Times, which admitted it made up stories of weapons of mass destruction in Iraq & pushed us to invade that country, has now endorsed Hillary Clinton, the candidate who voted for the Iraq War. I thought the Times had apologized and reformed itself. What Is going on here? Well, the Times likes its candidates to be realistic and pragmatic. And to them, that means Hillary Clinton. She doesn’t want to break up the banks, doesn’t want to bring back Glass-Steagall, doesn’t want to raise the minimum wage to $15/hr., doesn’t want Denmark’s free health care system. Just not realistic, I guess. Of course, there was a time when the media said it wasn’t “realistic” to pass a constitutional amendment giving women the right to vote. They said it would never pass because only all-male legislators would be voting on it in the Congress and the State Legislatures. And that, obviously, meant it would never pass. They were wrong. They once said that it wasn’t “realistic” to pass a Civil Rights Act AND a Voting Rights Act back to back. America just wasn’t “ready for it.” Both passed, in 1964 & 1965. Hillary says Bernie’s plans just aren’t “realistic” or “pragmatic.” This week she said “single payer health care will NEVER, EVER, happen.” Never? Ever? Wow. Why not just give up? Hillary also says it’s not practical to offer free college for everyone. You can’t get more practical than the Germans – and they’re able to do it. As do many other countries. Clinton does find ways to pay for war and tax breaks for the rich. Hillary Clinton was FOR the war in Iraq, AGAINST gay marriage, FOR the Patriot Act, FOR NAFTA, and wants to put Ed Snowden in prison. THAT’S a lot to wrap one’s head around, especially when you have Bernie Sanders as an alternative. He will be the opposite of all that. There are many good things about Hillary. But it’s clear she’s to the right of Obama and will move us backwards, not forward. This would be sad. Very sad. 81% of the electorate is either female, people of color or young (18-35). And the Republicans have lost the VAST majority of 81% of the country. Whoever the Democrat is on the ballot come November will win. No one should vote out of fear. You should vote for whom you think best represents what you believe in. They want to scare you into thinking we’ll lose with Sanders. 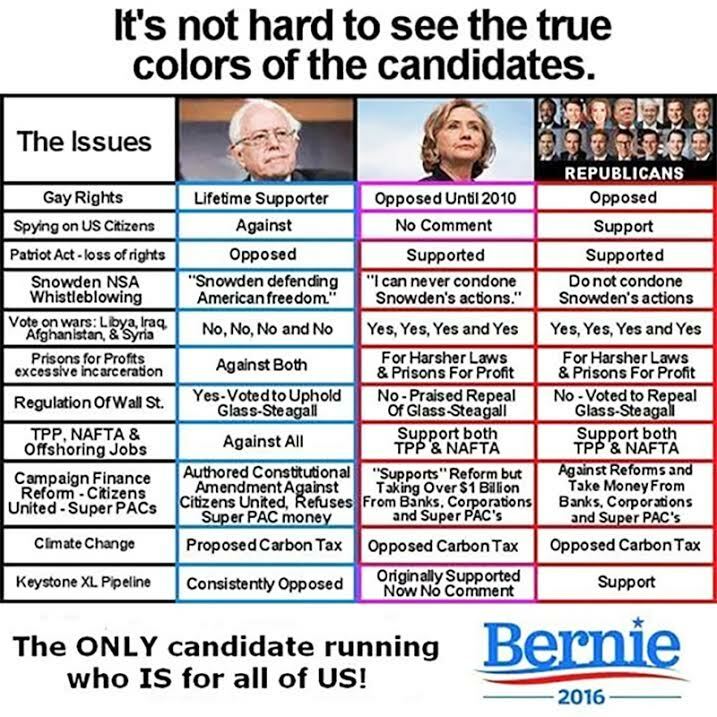 The facts, the polls, scream just the opposite: We have a BETTER chance with Bernie! Trump is loud and scary — and liberals scare easy. But liberals also like facts. Here’s one: less than 19% of the USA is white guys over 35. So calm down! I wouldn’t ask this of you if I didn’t think we really, truly needed him. And we do. More than we probably know. 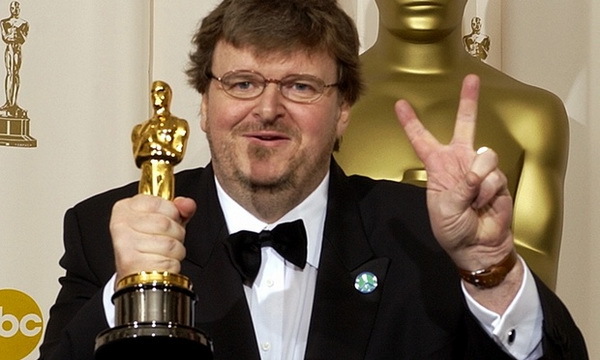 Esta entrada fue publicada en Michael Moore el 03 03-04:00 0202 03-04:00 2016 por Jimmy Olano. “President Obama, PLEASE come to Flint” by Michael Moore. Michael Moore, A REAL PATRIOT, a man who really loves his country (just like we love our country, Venezuela), arise his voice against the methodic procedure for destroy his land, overexploitation caused by “use and kick”, capitalism’s first rule. And the people? Who cares them? Who are CONTROLLING and applying the laws? Flint in Michigan needs help, SIGN THE PETITION of Michael Moore just here (goes to Michael’s web site). I added colors to text, some points I consider important. I am writing this to you from the place where I was born — Flint, Michigan. Please consider this personal appeal from me and the 102,000 citizens of the city of Flint who have been poisoned — not by a mistake, not by a natural disaster, but by a governor and his administration who, to “cut costs,” took over the city of Flint from its duly elected leaders, unhooked the city from its fresh water supply of Lake Huron, and then made the people drink the toxic water from the Flint River. This was nearly two years ago. This week it was revealed that at least 10 people in Flint have now been killed by these premeditated actions of the Governor of Michigan. This governor, Rick Snyder, nullified the democratic election of this mostly African-American city — where 41% of the people live below the “official” poverty line — and replaced the elected Mayor and city council with a crony who was instructed to take all his orders from the governor’s office. And, lo and behold, the Governor was right. It was a lot cheaper! Fifteen million dollars cheaper! And for saving all that money, it is now estimated that to repair the damaged water system in Flint, it will cost at least $1.5 billion. Someone had suggested to the governor, before he did this, that the river contained many toxins. He ignored that. One of his own people said maybe they should add a safe-to-drink “corrosive protector” to the water so that the toxins in said water wouldn’t leach the lead off the aging water pipe infrastructure and into the drinking water. “How much will that cost?” asked the governor’s office. “Just $100 a day for only 3 months,” the governor was told. Oh, $100 a day?! THAT’S TOO MUCH!, came the reply from the governor. Don’t worry about the lead. “Lead is a seasonal thing,” he would later explain to the public. “Heck, there’s lead in everything!” Just let them drink the river water. This is a city full of poor black people, a city where half the population (including myself) found a way to escape the misery and the madness (the crime rate is so bad, we’ve lead the country in murders for most years — and just to get an idea of what that means, if NYC had the same murder rate as Flint last year, over 4,000 New Yorkers would have been killed, instead of the 340 who actually were). My city has been pummeled by General Motors, Wall Street and the State and Federal governments. It’s no surprise that the Republicans who control our State Capitol in Michigan didn’t have to worry about any push-back from the residents of Flint because, to them, that’s just a bunch of eviscerated black people who have absolutely no power, “don’t vote for us any way,” and have NO means to fight back. And, as if things couldn’t get any worse, the news of 87 people with Legionnaires Disease happened this week. Ten Flint residents have been KILLED by this disease which is caused by tainted water. Not by gun violence, not in Afghanistan, but by an act of racism and violence perpetrated by the — I’m sorry to say — white, Republican governor of Michigan who knew months ago the water was toxic. All fingers from the doctors and scientists point to the filthy, toxic Flint River as the cause of this Legionnaires Disease outbreak. 10 human souls deceased. In an average year, Flint already had an astounding 8 cases (and rarely a death) of people contracting Legionnaires Disease. Since the citizens of Flint were forced to use the water from the Flint River, EIGHTY-SEVEN CASES OF LEGIONNAIRES DISEASE have happened! AND TEN DEATHS! And the number is expected to rise. NO! The STATE is the one who CAUSED THIS! That’s like asking the fox if he could repair the chicken coop. No, Mr. President, we need YOUR help — TODAY. 100,000 people have no water to drink, to cook with or to bathe in. This week, you are coming to Michigan to attend the Detroit Auto Show. We implore you to come to Flint, less than an hour’s drive north of Detroit. Do not ignore this tragedy taking place every day. This may be Gov. Snyder’s Katrina, but it will become your Bush-Flying-Over-New Orleans Moment if you come to Michigan and then just fly away. I know you don’t want that image of flying over us as you “fake-sad” look down on Flint just as Bush did in that never-to-be-forgotten photo-op over New Orleans. I know you are going to come to the rescue here in Flint. I can’t imagine any other scenario. The CDC here at once to truly assess all of the disease and damage that has been forced upon the people of Flint. FEMA has to supply large water containers in every home in Flint — and they must be filled by water trucks until the new infrastructure is resolved. The EPA must take over matters from the State (can the governor be removed and replaced like he did to the mayor of Flint?). Immediately. You must send in the Army Corps of Engineers to build that new water infrastructure. Otherwise, you might as well just evacuate all the people from Flint and move them to a white city that has clean drinking water — and where this would never happen. President Obama, I’m counting on you to give us a response. Can we expect to see you, in Flint, in the next few days? Esta entrada se publicó en Michael Moore y está etiquetada con Barack Hussein Obama en 17 17-04:00 0101 17-04:00 2016 por Jimmy Olano. “We are all Muslim” by Michael Moore. 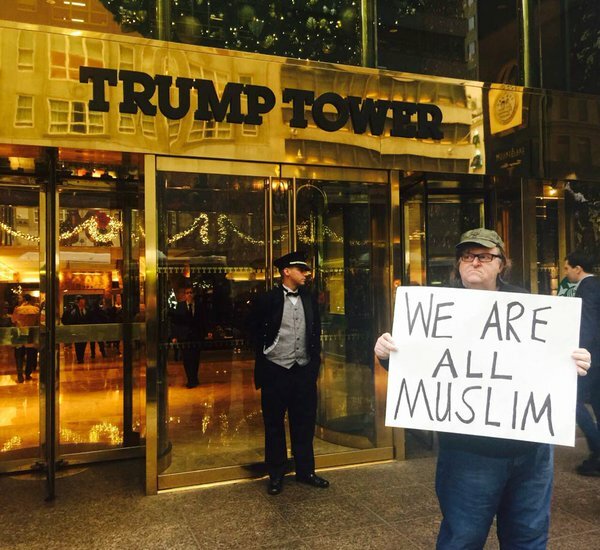 “We are all Muslim” by Michael Moore (Twitter @MMFlint). Preface: mister Michael Moore is clear about what is a Republic and what is an Empire. He is a Republican (word’s good sense, no mistakes) and has seen how his country is falling down, his society has dignity but has limits too. The intolerance is very high from Donald Trump; this person forgot how the united states was risen, with the immigrant’s sweat: irish, italian at east coast, chinese and japanese at west coast. Michael Moore is right, the others, what are thinking? Again the font and colours are mine, my “watchings” je je je. “Does he think I’m going to tackle him and put him in a choke hold?” I asked, bewildered. “Pick on” you? I thought, where are we, in 3rd grade? I was struck by how you, a self-described tough guy from Queens, seemed like such a fraidey-cat. You and I went on to do the show. Nothing untoward happened between us. I didn’t pull on your hair, didn’t put gum on your seat. “What a wuss,” was all I remember thinking as I left the set. Fortunately, Donald, you and your supporters no longer look like what America actually is today. We are not a country of angry white guys. Here’s a statistic that is going to make your hair spin: Eighty-one percent of the electorate who will pick the president next year are either female, people of color, or young people between the ages of 18 and 35. In other words, not you. And not the people who want you leading their country. So, in desperation and insanity, you call for a ban on all Muslims entering this country. I was raised to believe that we are all each other’s brother and sister, regardless of race, creed or color. That means if you want to ban Muslims, you are first going to have to ban me. And everyone else. Just as we are all Mexican, we are all Catholic and Jewish and white and black and every shade in between. We are all children of God (or nature or whatever you believe in), part of the human family, and nothing you say or do can change that fact one iota. If you don’t like living by these American rules, then you need to go to the time-out room in any one of your Towers, sit there, and think about what you’ve said. And then leave the rest of us alone so we can elect a real president who is both compassionate and strong — at least strong enough not to be all whiny and scared of some guy in a ballcap from Michigan sitting next to him on a talk show couch. You’re not so tough, Donny, and I’m glad I got to see the real you up close and personal all those years ago. P.S. I’m asking everyone who reads this letter to go here and sign the following statement: “WE ARE ALL MUSLIM” — and then send post a photo of yourself holding a homemade sign saying “WE ARE ALL MUSLIM” on Twitter, Facebook, or Instagram using the hashtag #WeAreAllMuslim. I will post all the photos on my site and send them to you, Mr. Trump. Feel free to join us. Esta entrada fue publicada en Michael Moore el 17 17-04:00 1212 17-04:00 2015 por Jimmy Olano.